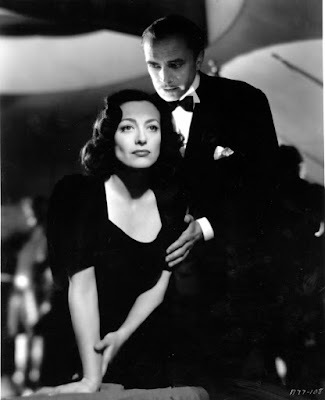 Today, I'm reviewing Warner Archive's new DVD re-release of A Woman's Face (1941), starring Joan Crawford and Conrad Veidt. 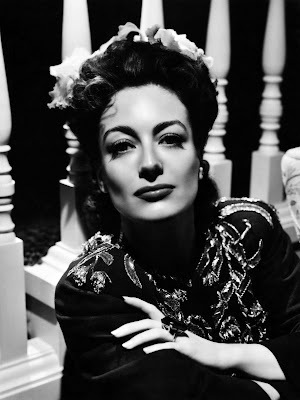 The good folks at Warner Archive are bringing six classic Joan Crawford movies back into print. Each Friday in March and the first Friday in April, I'll have a review of one of these movies. 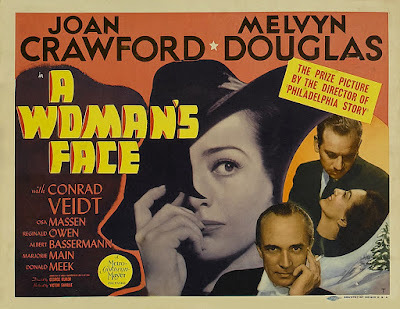 Today's selection is the melodrama, A Woman's Face. Warner Archive re-released five films of Crawford's great rival, Bette Davis, in September. You can check out my series on those films here. 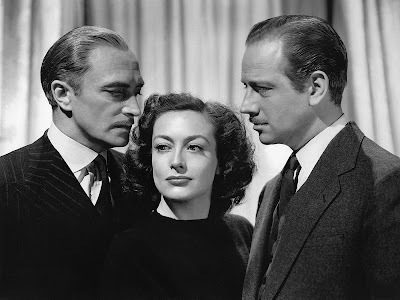 The Stars: Joan Crawford; Melvyn Douglas; Conrad Veidt; Albert Bassermann; Richard Nichols. Source Material: The French play, Il Etait une Fois by Francis de Croisset. The Plot: Anna Holm (Crawford) is the leader of a Swedish gang of criminals who blackmail the wealthy for their intimate secrets. 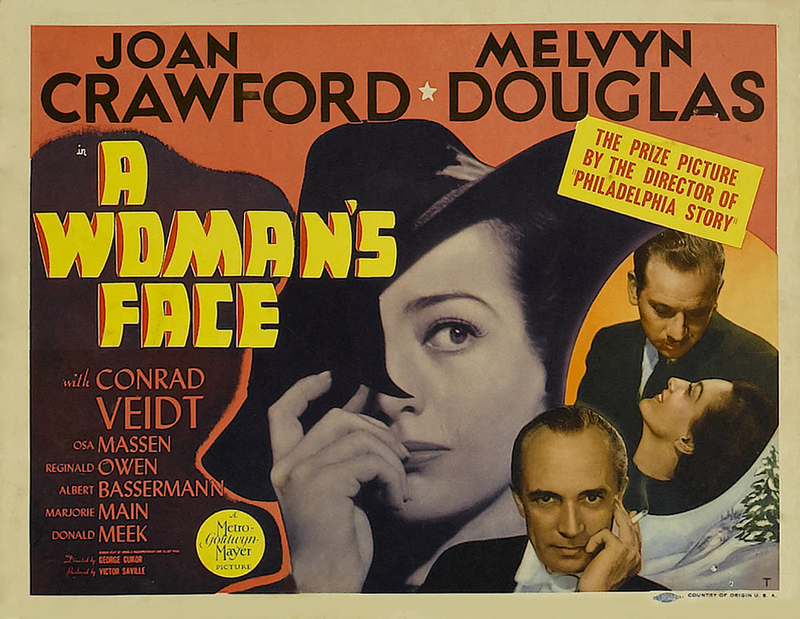 Anna is disfigured by a burn she received in childhood, and one evening, when she is attempting to blackmail the adulterous wife (Osa Massen) of a prominent plastic surgeon (Melvyn Douglas), he meets Anna and immediately offers to repair the damage to her face (he doesn't know about the blackmail). After the surgery, Anna returns to her lover, master criminal Torsten Barring (Conrad Veidt), who gets her a job as the governess to his 4-year-old cousin (Richard Nichols) with the proviso that she murder the young boy so he can inherit his uncle's vast fortune. Backstory: Croisset's play had already been filmed once in 1938 as a Swedish film starring Ingrid Bergman. Crawford fought for and got the chance to star in the remake, even though MGM chief Louis B. Mayer was appalled that his No. 1 glamour queen was going to appear in a role that disfigured her famous face. Conrad Veidt, Joan Crawford, and Melvyn Douglas in a publicity still for A Woman's Face (1941). Joan's career at the time of A Woman's Face: Crawford was one of MGM's top stars in pre-code Hollywood, but her career had slipped a bit in the late 1930s, and she was labelled "box-office poison" until her comeback in director George Cukor's caustic comedy, The Women (1939). Crawford reteamed with Cukor to make A Woman's Face, which proved to be one of the most challenging and rewarding roles in her career. Crawford won her only Academy Award four years later for Mildred Pierce (1945), but she would always feel the Oscar was partial recognition for her stellar work in this film. Joan's men: No Crawford movie is complete without at least two men in the cast hopelessly in love with her. Here's the rundown of her leading gents in A Woman's Face. Dr. Gustaf Segert: Played by Douglas, this kind-hearted plastic surgeon immediately falls for Anna even though she's in the middle of robbing and assaulting his wife when they first meet. He serves as Anna's conscience for most of the movie, even going so far as to hitch a precarious ride on an airborne coal bucket to keep her from killing her young charge. Torsten Barring: Veidt accurately described his character as "Lucifer in a tuxedo." The legendary German actor gives a memorable performance of gleeful villainy as a master criminal who seduces Anna so he can use her for his own evil purposes. Joan's clothes: Crawford dialed down her usual fashion flamboyance for A Woman's Face, but the movie still features her in memorable designs by Adrian. 1. Crawford spends most of the movie in a large fedora hat and black trench coat. Even though this costume is relatively simple, the large shoulder pads make it a distinctly Crawford style. In fact, in the opening scenes of the film, viewers only see Crawford from behind, but she is nevertheless instantly recognizable. 2. While she is working as a governess, Crawford wears an unusual Scandinavian folk costume that makes her look like a more menacing Fraulein Maria. Joan Crawford in a publicity portrait for A Woman's Face (1941). Best scene: Cukor isn't remembered as a great action director, but the exciting scene with Crawford, Nichols, and Douglas dangling over a steep mountain gorge is simply breathtaking (clip below). Best Line: "Skol, satan." -- Anna's memorable toast to Torsten. Fun Fact: A Woman's Face has fascinating similarities to another 1941 release, Citizen Kane. The film's plot unravels in flashback scenes that are narrated by different characters, and the visual style is quite similar to Orson Welles' masterpiece. There are tilted camera angles, multiple mirrors, and even a childhood sled. The Critics: A Woman's Face has an 100 percent fresh rating on Rotten Tomatoes, and Leonard Maltin writes that "Crawford has one of her most substantial roles in this exciting yarn" in a three star review for his Classic Movie Guide. The Bottom Line: Viewed today, A Woman's Face is a fascinating melodrama that has elements of film noir. Watch it for one of Crawford's best performances, the accomplished camerawork, and the breathtaking action sequences. Check out my review of Crawford's pre-code musical, Dancing Lady (1933). I recall that on my first viewing I wasn't sure how I was feeling, but stuck with it and am certainly glad I did. It is a movie that will haunt a person. It's sort of two films: noir in the first half, exciting action in the second half. I saw this film very early in my interest in classic films and definitely need to see it again! The noir elements and the career of Conrad Veidt (love his description of his role as "Lucifer in a tuxedo") and similarities to Citizen Kane totally escaped me at the time. Thanks!